Last time we took a look at some of the creatures of the pond, including the dragonfly nymph. Today, we examine the all-grown-up dragonflies in the field you are used to seeing on summer days! Dragonflies are not dangerous, but the extra large ones can bite you something fierce if you handle them wrong. Dragonflies originate in the water when the nymphs climb up onto a stem and emerge from their exoskeletons. The abandoned exoskeletons are called exuvia. They look just like the nymphs, but they are brown and lifeless. 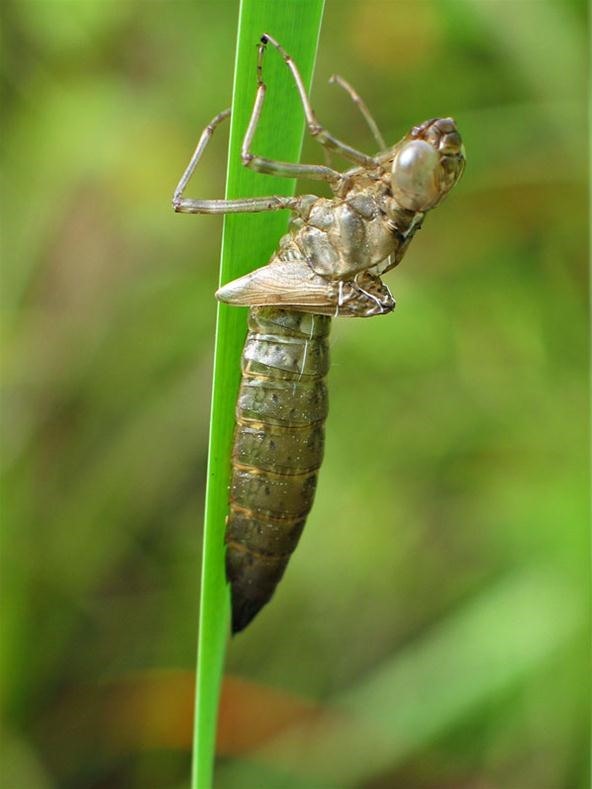 When they emerge from the exuvia, dragonflies need to dry off their wings for a few hours before they can fly. If you see a dragonfly with shiny wings that doesn't fly away from you, leave it alone. The poor guy has just started breathing air! Time to start tracking some dragonflies. Patience is your best bet here. Stare at the field waiting for a dragonfly to cross your field of vision. When you spot one, follow it until it lands. It is possible to catch them on the wing, but this is much more difficult. Bring your net down over the dragonfly. They can only fly upwards, so it should fly into your net as you bring it down. It is helpful to do a little insect anatomy review before we get into identifying the species of our dragonfly. 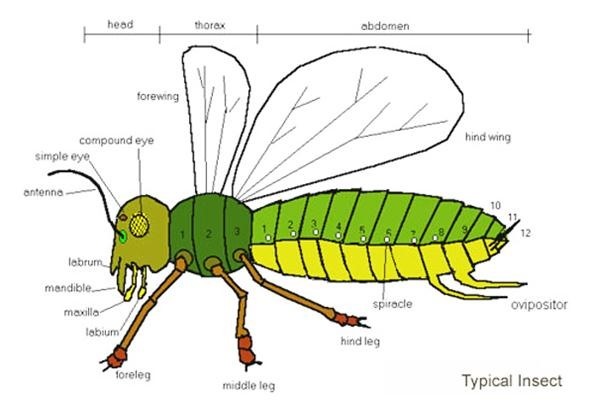 Insects have three body parts: head, thorax, and abdomen. Notice that the wings and legs are connected to the thorax. The abdomen is not a tail! Do not touch the abdomen! This is where insects breathe from. If you examine the underside of your dragonfly closely, you will see the abdomen expanding and contracting. 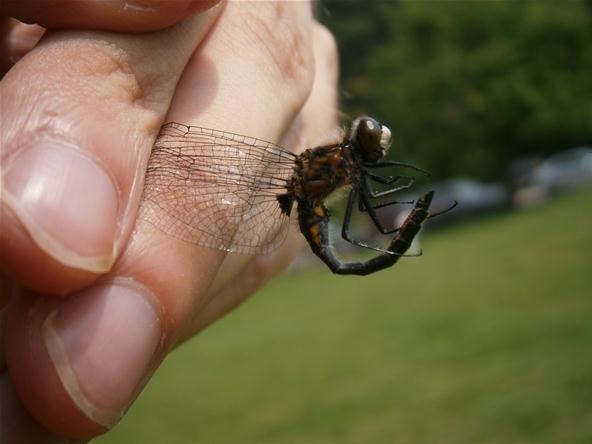 It is also worth noting that dragonflies often try to stab you with the end of their abdomen. Just leave it alone. As I said before, there is a risk of minor dragonfly bites if you mishandle the captives. To correctly handle the dragon, follow these steps. Hold your net upside down and pull the center upwards to form a pyramid shape. Your dragonfly should fly up to the end of the net. Bring your hand up into the net and place your middle and index fingers on either side of the dragonfly underneath the wings. Lift your fingers closing them over the wings so that all four wings are pinched behind the dragonfly's back. We do this for your safety and for the dragonfly's. If you hold it anywhere else, the dragonfly will use its powerful flight muscles to attempt an escape. Unfortunately these muscles are so powerful they can rip the dragonfly apart if a leg or wing is still caught between your fingers. Our method keeps the wings safe and the flight muscles subdued. Notice that the dragonfly is curling its abdomen around in an attempt to poke me. There are a ton of different species of dragonfly, but you can usually use their color patterns to determine which is which. A quick Google search will yield tons of helpful ID charts. I prefer to buy a small laminated ID pamphlet from my local audubon sanctuary. They are cheap, easy to use, and tailored to the dragonflies in your specific area. Examine the coloration on the wings, eyes, and abdomen and compare with your chart. In my area, Eastern Pondhawks are the most common species. If you are scared of holding the dragonfly and still want to have a close up look, try putting it in the refrigerator for ten minutes. 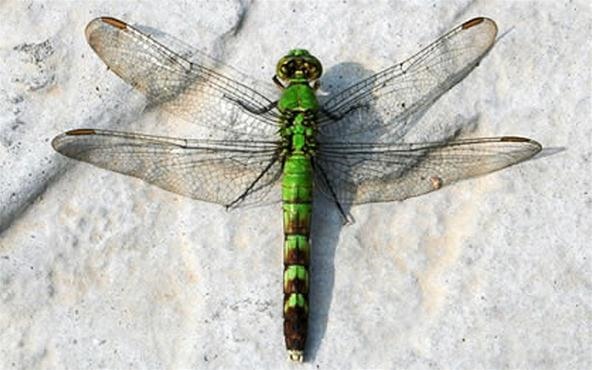 Once cool, the dragonfly will not have the energy to move its wings or legs. This trick works great if you want to take some microscope pictures but don't want to kill your dragonfly. Damselflies are often confused with dragonflies. You can tell them apart by their wings. Dragonfly wings stick straight out while damselfly wings come together behind the abdomen. 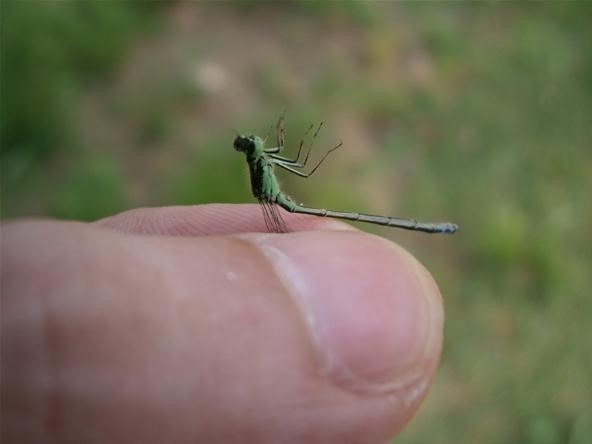 Damselflies are usually skinnier and slower than dragonflies. 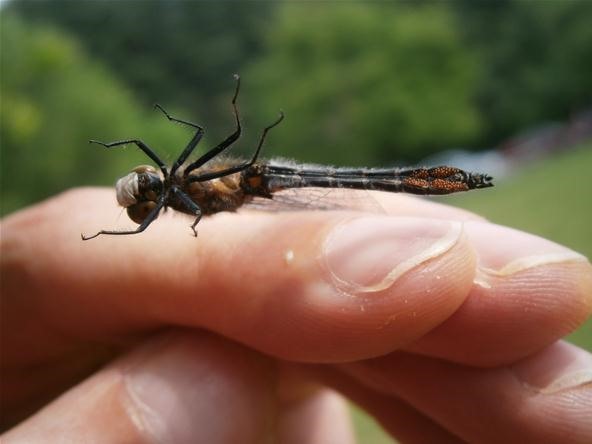 Many dragonflies have parasites stuck to the bottom of their abdomens. If there are too many parasites, a dragonfly will die from suffocation. The one I caught had only a few of these red bumpy guys stuck on. They don't seem to hinder the dragonfly's flight or movement, so I'm sure this one will find a mate and reproduce. This is great for the parasites as they will come into contact with the mate and potentially the eggs. Now that you know how to capture and examine dragonflies, it's time to rampage through the field. Once you start, you will want to catch every species of dragonfly you see. These creatures really are beautiful and worth appreciating, not to mention that they magically emerge from the watery depths like Poseidon's fighter jets. If you look around long enough, you will see dragonflies effing up all kinds of insects.